Gross mortgage lending declined to an estimated £11.4 billion in August, down 14% from £13.3 billion in July and 6% from £12.1 billion in August 2009, according to new data from the Council of Mortgage Lenders. This is the lowest August total since 2000 (£11.1 billion). Lending volumes are likely to remain below last year’s level in the coming months as activity was buoyed by the upcoming end of the stamp duty holiday in the last few months of 2009. That's quite a stunning statistic given the UK base rate was 6% back in August 2000. Given the recent sharp MOM fall in prices this could really mark the start of the next journey downwards. "This is the lowest August total since 2000 (£11.1 billion)." August 2000 was going the low before great 7 year cycle up began. A 56.8% drop may seem impossible, but Hong Kong had a 69% drop from 1997-2003. Remortgaging accounted for only a quarter of home loans in August, the lowest proportion in more than a decade, according to the figures published by the Council of Mortgage Lenders. Just 25,000 loans were approved for house purchase in August, down 13 per cent on the previous month and 19 per cent lower than a year earlier. Banks have tightened their lending criteria in recent months amid fears that higher unemployment will result in home owners defaulting on their loans. The curtains are being drawn on the mortgage equity release episode, it would seem, people are starting to wake up. Of that Pds. 25k gain last year, over Pds. 17k was given back in two months. I reckon the give back will be even greater this year. "I am very confused at the moment as to where the property market is heading, obviously no one can predict the future but was just looking for other peoples views here. About 2 weeks ago i read in the news that house prices were set to rise maybe 20% over the next 4 years or so, which sounded promising after all the doom and gloom of late." Yes, it is difficult to predict accurately. Most cannot do it, especially Estate Agents, who will always tell you what you want to hear. But if you use cycles, and some other technical indicators, you can sometimes have a good idea of what the future path of property moves might be. If you follow the tinyurl link given in the chart, you can get an idea of how the forecast was made, and what may lie ahead. Warning: the Property Bulls may not like it! Nationwide was -0.7% today (or -1.4% for NSA). Now tantalisingly close to going YoY negative. Once that happens I think sentiment and prices will take another big lurch down as people buying on the bounce in the last 18 months will realise they've lost money in the last year and that the bull market really is utterly dead and buried. Actual m-o-m figure is -0.7%, right in the middle of the -0.5-1.0% Crash Cruise speed. Housing dip feared as mortgage approvals stall .. Fears of a double-dip in the housing market were exacerbated today with news that the number of mortgage approvals remained static in September, while net lending (not including redemptions and repayments) was just £112m during the month – down from £1.62bn in August. The Bank of England statistics showed approvals for new home loans in September totalled 47,474 – near-identical to the August figure of 47,498 but lower than the previous six-month average of 48,764. This follows yesterday's announcement from Nationwide Building Society that house prices fell by 0.7% in October, taking the quarter-on-quarter drop to 1.5%, the biggest decline since April 2009. Analysts said the overall trend for mortgage lending was downward, reflecting high (and likely to rise) unemployment, muted wage growth, and low and deteriorating consumer confidence. Howard Archer of IHS Global Insight said low mortgage interest rates and the current stamp duty holiday for first-time buyers on all properties costing up to £250,000 only partially offsets these adverse factors – especially as it is difficult for many people to get a mortgage. 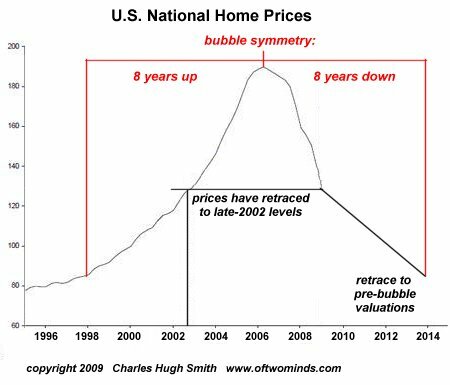 "Much will obviously depend on mortgage availability, the amount of houses coming on to the market and how well the economy holds up as the fiscal squeeze increasingly kicks in," Archer added. I don't fully buy those comments. The problem is not just "mortgage availability", it is also sentiment. People can see that the tide is turning lower, and they are not eager to take mortgages now, when they think they they can save money by buying later. (Of course, the BBA does not want to risk harming their business by telling you that.) All British people are not just stupid sheep, who will just buy because they can. Many will wait to buy when prices are right (ie more sensibly priced.) They have been reading about falling prices, and can see that austerity lies ahead, so it makes perfect sense to wait. The desire to wait will intensify if/when the rate of prices falls accelerates, and/or interest rates begin to rise. That means that the net lending for this year is 1/12 of that seen in 2007 (the UK property peak). The group now expects net lending, which strips out redemptions and repayments, to be just £9 billion during 2010, well down on its original forecast of £15 billion and its revised forecast of £12 billion, and only a fraction of the £108 billion that net lending totalled in 2007. Total advances are expected to be around £137 billion, less than half the £363 billion advanced in 2007, and significantly lower than the group's original prediction for the year of £150 billion. The forecasts illustrate just how much the mortgage market has shrunk since the credit crunch first struck in the third quarter of 2007. They also suggest the market has failed to recover at all during 2010, as both forecasts are lower than the totals recorded for 2009. Meanwhile, separate figures from the Bank of England showed that mortgage lending for house purchase fell to a nine-month low of £5.3 billion during October. Even more than that ! This is the lowest figure of the year, 2010. In fact, you would need to go back to Aug. 2009 to find a lower figure. The 2009 low was Feb : 157,066, and Nov.2010 is only 3.95% above that. Q1 or Q2 next year. The -1.4% drop in Halifax's November NSA index is a big score in the Bear's column. By my reckoning, the H&N Index was down -0.9%, and we have moved into Crash Cruise speed ! O : : 236,849 : 418,778 : 156,200* 0.9% / 164,381 = n/a = 164,949 165,275 : £164,828 :- 0.02% :143.7% : Hi Delus. I have some charts you might find useful. Give me a second while I go to my computer and work out why they're not on my website. In fact, the fall may be quicker now that the Second Leg down is underway than suggested by my chart. Now that the mirror of that 2005 plateau has been traced out for the UK market, a symmetrical drop would suggest a rather ugly move down. I talk about "crash cruise speed" with prices averaging at least "0.5-1.0% down per month", but I think it could easily be faster than that, for at portion on the next 2-3 years. My H&Nindex is the average of Halifax and Nationwide. because the base upon which the 1% applies gets smaller over time. prices to return to historical multiples of income, without tampering. I think you might want to say when GC1 and GC2 started. My take on the endless supply of stats is that they are essentially meaningless. There is way too much noise in monthly stats. National stats over a longer period are meaningless too - what is happening in Newcastle may well be the exact opposite of what is happening in Guildford. So, who/what to take notice of? Regional stats over a long period? But the volume of transactions is so low that regional stats are so full of variations as to make discerning a trend impossible. Microscopic example. I bought a house a few months ago. An identical house in the next street (same estate) went on the market last week for £65k more than I paid. I was in a good position and the vendor was keen to sell - maybe I got a good deal (relatively speaking) - who knows? That's my point. The only value stats seem to have is to aid the general population's view of the housing market. So, hopefully, they'll stay negative for years and start re-conditioning the way people think about property. The data are valuable, provided you know how to use them. My advice is: IGNORE the seasonal adjustment. Focus on the actual raw data, and just be aware of the seasonality. Also: the NOISE and inefficiency is in actual prices. If you turn things around, and think this way, you can make consistently accurate forecast. Check my Property Diary and my track record, and I think you will find I have been doing rather well using the data (with some help from the Homebuilder stocks), since at least 2007. Well, this accurately reflects my experience of London. Agents say the family home market has been far stronger than that for flats and apartments because of demand from "equity rich" professionals and, in central London, from wealthy foreigners. Smaller properties favoured by first-time buyers have been more badly hit by the mortgage funding drought with prices rising just eight per cent between the last quarter of 2009 and the end of last year. Peter Rollings of agents Marsh & Parsons said that family homes in Battersea were the single fastest rising property category in London last year. I don't buy it. You are too close to the center of the madness to see it properly. Incomes in London are not rising so fast, and indeed - may be set to fall off a cliff - as multiple cataclysms hit the UK economy in 2011 and beyond. Having said that, I may start a thread soon on the Bull argument for UK property, to put the bull arguments to the test. 8.05	180,033	-2.56% "red box"
11.01	161,536	-0.37% "red box" coming ?? As I have said before : The UK has not really "faced its house crash demon" yet. The Brown regime wimped out in late 2008, when it was the first to move the QE and ZIRP. The coalition (and the country) will bear a heavy cross for a long time for that decision. But - to be fair - the crash is underway outside London. When will London face the demon ? Taken from the front page of HPC comments section on the Nationwide figures today. Posted by phdinbubbles. hmmm. Any thoughts on these stats? No you see why I do not use SA figures in my H&Nindex. NSA figures are relatively spin-free. A single month of no move (when the SA was negative in prior years) does not invalidate the trend in place. Some charts reposted from FreeTrader's HPC thread. It is likely now, imo, that we closer to the end of the UK property bear market than the start. ...I think the continuining excesses now, and the temporary nature of distortions from "ultra low rates", may mean this correction will ultimately be far greater than the prior one. THE REAL TEST is after the Spring, when rates rise and the HB cap slides into place. But prices are up on a 12 month horizon, (and have risen 3 out of the last 4 months). So the data can be reported however you like, but sometimes you just have to admit that the UK is weird. Pause or perhaps something more? Your builders index is showing a soft landing is it not? Of course, in real terms we will still get the ~10% down expected. Actually, I think you need to look at the BIGGER PICTURE - not just the Nationwide Data. That is why I track several indices, and look at them together. O : : 236,849 : 418,778 : 156,200* 0.9% / 164,279 = n/a = 164,949 165,275 : £164,777 :- 0.25% :143.7% : Hi Delus. What I see here, is a seasonally driven bounce back towards resistance at GBP 165,000 or so (as the Builder stocks have also been signalling IMHO.) You can track the big picture most easily, by looking at the "H&N Index" column. The economy has shown some signs of recover and wages are up a bit, but the BofE is recklessly keeping interest rates at ultra-low levels. Nationwide's report seems to be warning that current rate levels are unsustainable (and I am too - see the Zombie thread ). What's next? I real test of the resilience of the market, as Housing Benefits (finally!) get capped in April, and rates begin to drift higher. Watch wages and incomes - I think growth is need there to get any sort of soft landing. Meantime, I see Europe's debt troubles eventually spreading to the UK within 2011. Interest rate increases  how much of a hit? The Bank of England is likely to start the process of returning interest rates to more normal levels at some point in 2011. However, rate increases may exert more of a drag on the household sector than would have been the case before the recession. Mortgages account for around 85% of household debt and since 2008 the proportion of mortgages on variable interest rates has risen sharply, from 48% to 62%. How much of a squeeze on borrowers? For those with a capital repayment mortgage, a typical mortgage payment is currently around £4551, equivalent to 23% of individual take home pay. A one percentage point rise in interest rates would see this rise to £494 - 25% of current take home pay. In the five years before the crisis, the Bank Rate averaged 4.5%. A rise to this level would see typical payments rise to £621 if rate increases were fully passed on to borrowers. If the Bank of England were to increase interest rates to 4.5% by the end of 2013 and wages keep rising at the current pace of 2.3% a year, this would take typical payments on repayment mortgages to 29% of take home pay. What about builder's shares as being your indicator to house prices? Up 50% since last Autumn when Grant Shapps decided to block any moves to restrict mortgage lending by the FSA. I have to say that the Builders Shares have already anticipated what I have called, "A SPRING PAUSE" in the Crash Cruise Speed. But I think they would need to go higher, above the 987d/200wkMA perhaps, to signal that something more Bullish was afoot. The UK is storing up some big problems IMHO. It looks to me like BDEV had a "fake out" bounce on light volume in Sept. 2009, and the NEXT LEG DOWN is underway. I will expect a continuing slide in Uk House prices into 2012/13 or later. Next Buy signal would be: after the Builder shares break up on high volume. than 0.5% per month, is resuming. From a low in July 2008 (at 22p), Barratt/BDEV had a long rally into a Sept. 2009 high near 280p (184p- split adjusted), and then another downturn began. This drop in the share preeceded a fall in actual house prices. A few months later in Spring 2010 a second downleg in UK property prices began, despite continued ultra-low interest rates. BDEV continued to fall for most of 2010, but the rate of decline slowed and the stock bottomed in late Nov.2010 at near 71p, which was well above the Nov 2009 low of 31p. Then, a year-end rally in BDEV stock began, taking BDEV back near 90p by the end of 2010. In early 2011, Homebuilder prices rose further, with BDEV over 110p, suggesting a Spring 2011 "PAUSE" in the decline in UK-wide home prices. Will the house price rally last? I think not. The failure of the Homebuilder rally and a drop in BDEV back below 100p on high volume (If we see that), would be a sign that Crash Cruise Speed (with falls averaging more than 0.5% per month), is likely to resume. It's an interesting phenomenon. Transactions are low, prices are high and enough people want to buy the property that is available and have enough money to keep prices high. For those people hoping for a house price correction (and that includes me - for the benefit of my kids and everyone else's too) - it isn't looking too hopeful. Look at the Halifax reports, and it sounds like plenty of folks are standing aside. How much longer will sellers be able to hold up prices before caving in, and cutting them to find buyers ? The buying enthusiasm which usually comes in the Spring will fade soon, and the buyers that are still there will be more practical, and the sellers may soon panic, cutting prices more drastically. So the NSA was up 0.31%, doesn't the figure come in about 4% in a normal market this time of year that's why we get SA. How does it compare to 08/09 for the same month. The offers need to start coming down, if the market is going to slide. I reckon it will happen, but there's no real evidence in the data... yet. Could be the weakest bounce in the 3 year period. 2011 seems to be running well below the seasonal average. The following figures might put the unhealthy balance into perspective. What are the vendors smoking? Using H&N (non-seasonally adjusted), the latest figure is ABOVE any month in 2009. But it compares May Rightmove with the latest H&N index (which is April.) If the May H&N index falls, then the May Delusion index will be even more extreme ! Maybe someone should post this on HPC. I do think the H&N averages are more accurate.